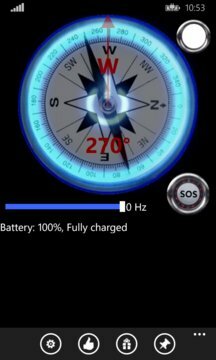 Flashlight IS THE MOST POPULAR, BRIGHTEST AND FASTEST FLASHLIGHT application that LIGHTS CONSTANTLY USING THE PHONE'S CAMERA FLASH LED, displays COMPASS and RUNS UNDER LOCK SCREEN. More than 16 million downloads. BEST FLASHLIGHT APP! "Works greatly on my Lumia 920. 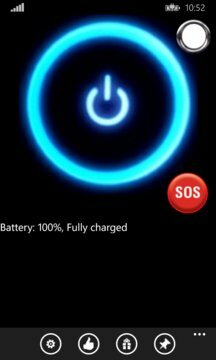 This is the BEST Flashlight app!" "Shines Bright like a diamond! Lls"
"whatca lookin at? Lol, buy this app works great. =)"
"This is the Best flashlight app. Faster than others. Very bright and easy to use. Very handy on power cut situations. Absolutely worth it!" "Quite handy, simple, and very effective. Beautiful little app." (*) Lumia 505, 510, 520, 521, 525, 630, 635 and HTC Mozart does not have LED flash but you can use white screen as alternative.